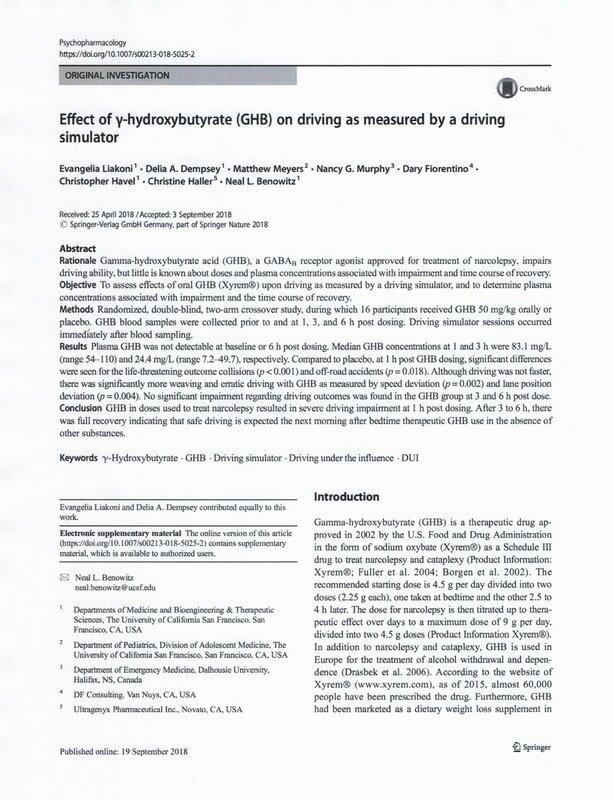 Effect of γ-Hydroxybutyrate (GHB) on driving as measured by a driving simulator. Rationale: Gamma-hydroxybutyrate acid (GHB), a GABAB receptor agonist approved for treatment of narcolepsy, impairs driving ability, but little is known about doses and plasma concentrations associated with impairment and time course of recovery. Objective: To assess effects of oral GHB (Xyrem®) upon driving as measured by a driving simulator, and to determine plasma concentrations associated with impairment and the time course of recovery. Methods: Randomized, double-blind, two-arm crossover study, during which 16 participants received GHB 50 mg/kg orally or placebo. GHB blood samples were collected prior to and at 1, 3, and 6 h post dosing. Driving simulator sessions occurred immediately after blood sampling. Results: Plasma GHB was not detectable at baseline or 6 h post dosing. Median GHB concentrations at 1 and 3 h were 83.1 mg/L (range 54–110) and 24.4mg/L(range 7.2–49.7), respectively. Compared to placebo, at 1 h post GHB dosing, significant differences were seen for the life-threatening outcome collisions (p < 0.001) and off-road accidents (p = 0.018). Although driving was not faster, there was significantly more weaving and erratic driving with GHB as measured by speed deviation (p = 0.002) and lane position deviation (p = 0.004). No significant impairment regarding driving outcomes was found in the GHB group at 3 and 6 h post dose. Conclusion: GHB in doses used to treat narcolepsy resulted in severe driving impairment at 1 h post dosing. After 3 to 6 h, there was full recovery indicating that safe driving is expected the next morning after bedtime therapeutic GHB use in the absence of other substances.